Fyi, this post turned out to be without much humor and relatively minimal thought to life outside of marathon training. For those who run, I’d love your thoughts. Everyone else, this one will almost certainly bore you right off the page. While there are a lot of up-sides to life on the road, this is one of the more recent reasons to celebrate the here and now. Our current home is nestled 2600 feet above the coast on the side of a cloud forest mountain. It is rural and jungle and feels miles from everything, which it mostly is. 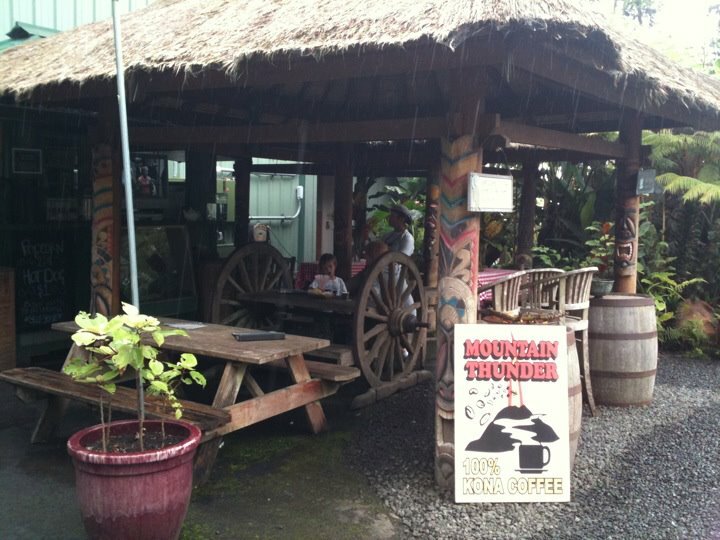 But one of the few places nearby happens to be a world-class, organic, Kona coffee producer. Free tours, free coffee samples, and literally “the best coffee in the world,” as judged by people who know coffee. Seeing how painfully exacting it is made, it is slightly less shocking to see “$55/pound” on the bags for sale on the way out. With the exception of a couple of the weeks in the mountains, I didn’t hit the total weekly mileage I had anticipated. But, I’m not too worried about my aerobic base. While I didn’t end up doing a 30-miler in the build-up (a good decision, I think), I have logged 15M or longer 14 times in 15 weeks (even with 4 of those weeks without a long run). And 6 runs of at least 20 miles seems about right for a marathon build-up. With just one run of 15 miles left before the marathon, I feel pretty good about my long runs. Where I think I may have slipped up is the speed work. I had good intentions and, more weeks than not, at least one good speed-oriented session. Interesting to me, the best and most intense efforts were mostly on the treadmill in the first 7 weeks. And, without question, Mike Sandrock in Boulder pushed me hard a few times in Boulder. But the time in Hawaii has me seriously questioning my race fitness: while I felt like I was getting faster in Austin and in the Rockies, I was way off the pace on basically all the speed workouts while in Kona. A lot will come down to how I’m feeling on race day. If it is cool and dry, as is usually but not always the case for St. George, I think I’m in a position to do well. I’m lean without feeling undernourished, having put on a smidge of squish in Hawaii, thanks to slightly lower mileage, lots of lounging on the lanai, and wonderfully delicious and generous cooking by my mother-in-law. (Thanks, Marianne!, I think.) I think I’m about as well prepared for the downhills as I can be in 15 weeks of training, having really hit them hard and frequently, with just enough time in between to recover and get stronger. The upside to the Kona training has been lots of miles on pavement, which has been a solid way to up the mental and physical readiness for a road marathon. It has been since February 2010 that I’ve run a road marathon and the daily miles, mostly along the Ironman Championship marathon course, have toughened me up. I’m not saying that trail is always physically easier but it is more fun and, for that reason, it doesn’t typically force me to push myself into the same place of mental pain. And that’s somewhere I need to be prepared to be, at least for a couple of hours on October 1st. And there’s little I look forward to more.